Or pay only P 14,265 a Month for 6 months. ZenBook Flip S is a timelessly elegant masterpiece, exquisitely crafted from solid aluminum. The chassis is forged from a single block of metal that’s carefully honed until it's a mere 10.9mm thin. Weighing just 1.1kg, it’s effortlessly portable. And because it’s made from premium, aerospace-grade aluminum, it’s lighter than standard laptop alloy but 50% stronger. 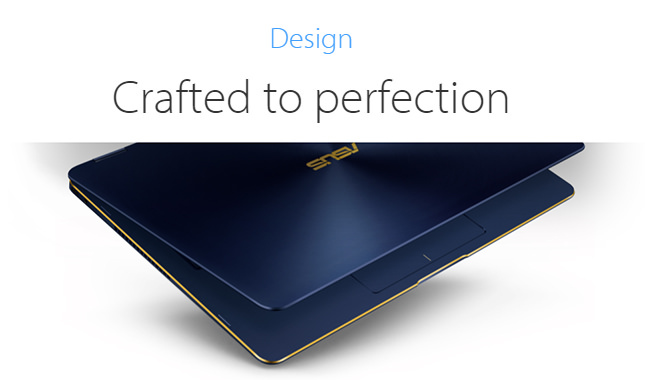 Designing ZenBook Flip S required serious engineering prowess and craftsmanship. The ultra-thin profile meant we had to invent the ErgoLift hinge — the world’s most compact flippable hinge — to preserve its sleek lines. 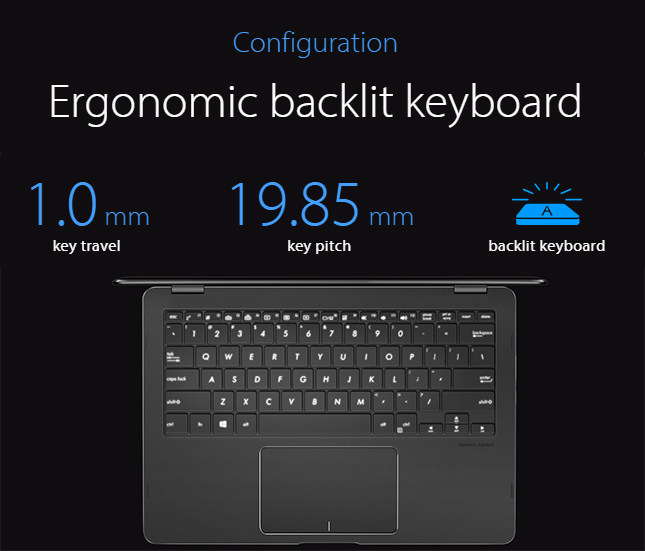 To accommodate the full-size keyboard, we had to create an ultra-slim surround. To add a touch of luxury, we added brilliant diamond-cut highlights to the edges. ZenBook Flip S is renowned for its unique, stunning looks. You’ll instantly recognize the iconic, Zen-inspired spun-metal finish* on the all-metal unibody enclosure — a finish that takes 40 painstaking steps to create. * Royal Blue color option only. 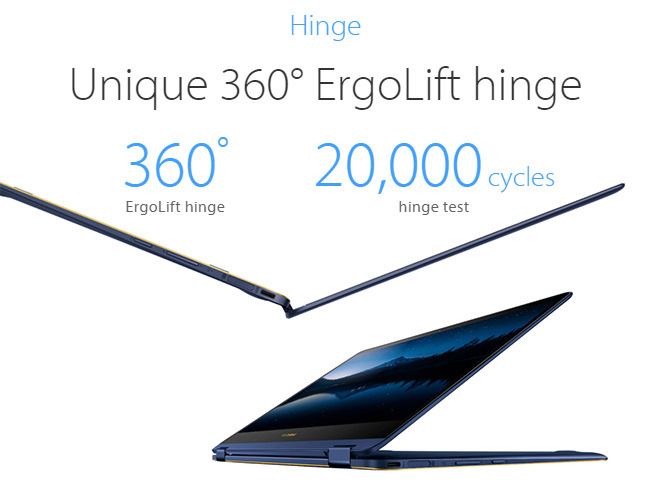 Featuring a precision-engineered multi-gear metal mechanism, the new 360° ErgoLift hinge on ZenBook Flip S has a silky-smooth, stepless action, and it holds the display securely at any angle. This innovative hinge has a dual-action mechanism that lifts and tilts the keyboard into the perfect typing position when the display is opened beyond 135°. To ensure maximum reliability, the ErgoLift hinge is torture-tested by more than 20,000 open/close cycles — so you never have to worry about durability! The NanoEdge multitouch display on ZenBook Flip S offers all the quality you'd expect from such a beautiful laptop. 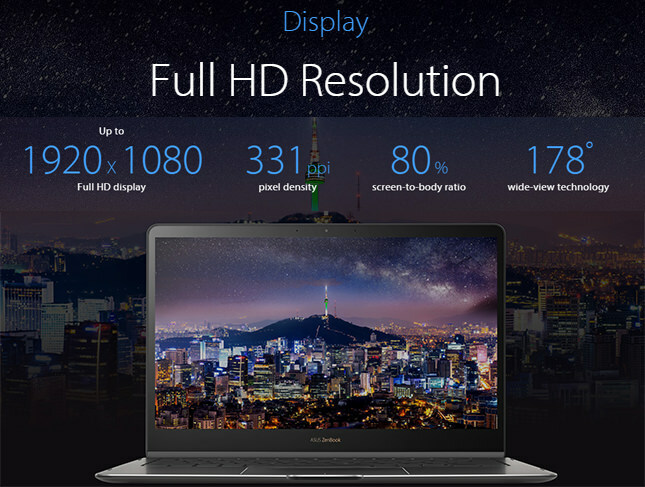 The ultra-sharp screen offers an amazing Full FHD resolution of 1920x1080, and it features 178° wide-view technology — so imagery looks great from almost any angle. And with an incredible pixel density of 331ppi, images and text are always pin-sharp and ultra-detailed. 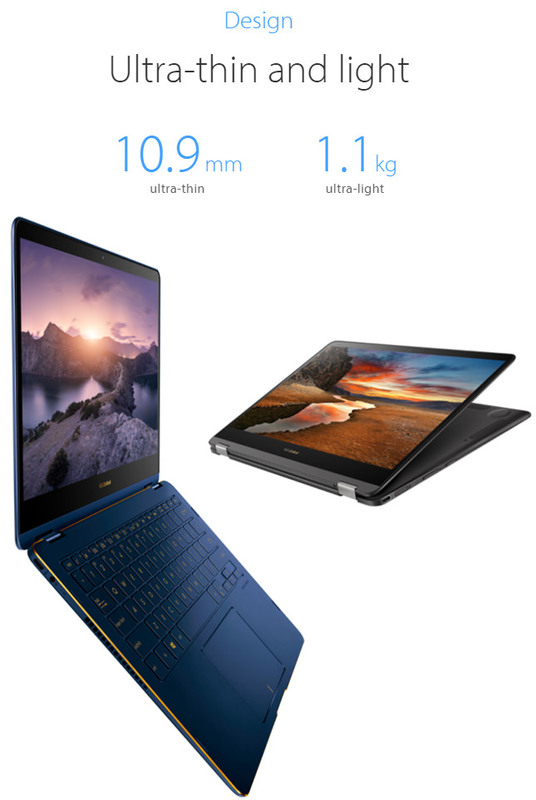 In designing ZenBook Flip S, ASUS engineers set an ambitious goal of creating an ultra-thin laptop with unprecedented performance. Despite some tough challenges along the way, they’ve succeeded. 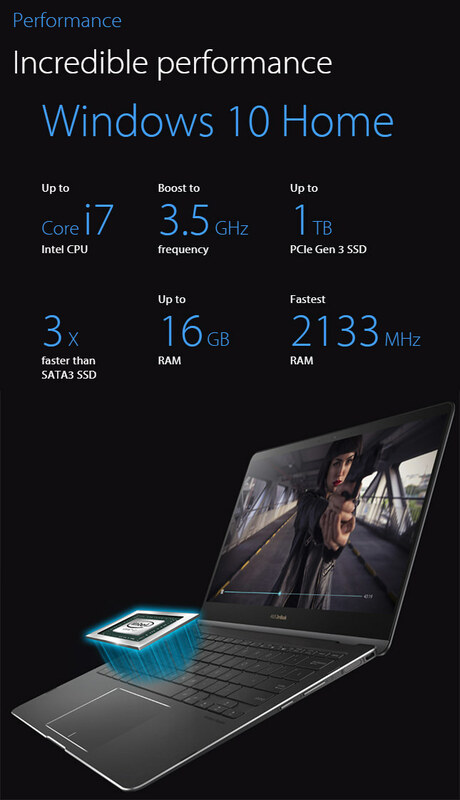 The result is an unbelievably powerful laptop that features the latest Intel® Core™ i7 processor, up to 16GB of 2133MHz LPDDR3 RAM, an ultra-fast up to 1TB PCIe® Gen 3 SSD, and a USB-C™ port for display output, data transmission and fast charging. So there’s no need to worry about what you can or can’t do with ZenBook Flip S — it’s practically unstoppable.